Reagrupament International | On 28/11 we don’t limit ouselves to change of regional government, we want to change of state. Lately everyone is talking about the ‘useful vote’ as a way not to ‘throw away the vote’, with the idea that your vote must have a noticeable effect in the results. These are all meaningless words. In many occasions I voted parties that never got into the parliament and I never had the feeling that my vote was useless. Instead, I did have the feeling my vote was useless after voting a party that got 23 deputies and on the next elections 21, after doing nothing of what they had promised to do. In those cases my vote surely was absolutely useless. I am convinced now that Reagrupament will achieve representation in the Parliament of Catalonia. And it will get there despite all the polls that from now on until the election day will insist on wanting people to believe that our result will be zero. The aim of these polls is to take care the ones that win are the ones that always won, demobilize our associates, our thousands of future voters and to persuade the public that the Reagrupament vote is a wasted vote. Do not believe them. The only vote that is useless is the one that betrays your own convictions. The most useless vote is the vote given to a party you already know will not be able to fulfil their promises: no economic agreement with Spain, no federal state, no reforms of the Constitution, nor a self-determination referendum. All of this is impossible with the Spanish law in hand. The only possible step is the unilateral proclamation of independence from the Parliament of Catalonia. Only that depends on the free will of the Catalan citizens, the only step that does not require negotiations with the Spaniards. But to make it possible we need a minimum of 68 deputies. Do you believe any of the political parties that are participating to the election on November 28, will be willing to take this step towards freedom of Catalonia? Do you think any of the candidates for deputy of these formations have the courage to carry out this act of sovereignty? If until now they have not even been able to make a new statute, nor a worthy funding system, nor anything with which we’ve able to make a millimetre of progress in the process towards sovereignty … What should make us think now they will be able to make a step forward after 28-11, or that they will be able to take a step towards having a Catalan State? 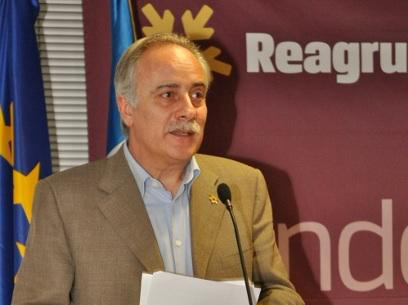 Reagrupament’s only objectives are: independence, democratic regeneration and work. That is: a Catalan state, high quality democracy and a society that seeks entrepreneurial excellence. We do not want to manage the government of a Spanish autonomous region, we do not want to occupy any vacancies in the Spanish administration, with their salaries and bureaucratic chairs. We have taken a commitment to Catalan society, to all those who are determined to vote for independence on 28-11: that we’ll move this country towards sovereignty and that we will work to achieve that a minimum of 68 deputies are in favour of proclaiming the independence of Catalonia. I know, looking at the political landscape around us, that if we don’t do this nobody else will. On November 28 it is important to put an end to the actual coalition, it is important to have a majority in Parliament in favour of sovereignty, it is essential that the Catalan patriots don’t stay at home.